When I started working after I had finished school I was only an occasional drinker. I did fairly well in rugby and athletics. After rugby matches and athletic gatherings the guys usually went for a drink or two. I did not really want to drink with them, but sometimes did, because I did not want to feel out. At some functions I did have too much to drink. Without me even realising or intending it, my problem with alcohol became worse. I did not have a clue as to the dangers awaiting me. I was young, hardworking, diligent and healthy. At the age of 29 my whole life changed. I had a heart attack and was hospitalised. The internist recommended that I stop smoking and that I rather drink water with my brandy instead of Coca-Cola. He also recommended that I drink whisky and water. I firmly believed that my chances for another heart attack were much slimmer if I drank more whisky. At that stage I was probably already addicted to alcohol and therefore a candidate for rehabilitation, but I never went for treatment. On a few occasions I was hospitalised for so-called stress, heart cramps and several other symptoms, but my problem was in fact ALCOHOL. From 1984 I was a member of the church council even though I was a hard drinker. On several occasions I was even the leader of the deacons. When I collected money in my ward or attended church, I made sure that I was sober. Many Sunday mornings I still felt sick when I attended church. To cover up the alcohol smell I ate lots of peppermints and rinsed my mouth with vanilla essence. I truly believed that it took the alcohol smell away. In the meantime I had married Ronél. We had a very happy marital relationship out of which two children were born. I often promised Ronél that I would stop drinking, but never mentioned for how long I would stop. I was always looking for opportunities to drink. One such opportunity was COMMUNION. It was a very good excuse to use alcohol and to smell like it. Ronél was also a good excuse when I started drinking again. The fact that I abused Communion worried me a lot and I often asked God for forgiveness. TODAY I know that GOD has forgiven me. At one stage I was hospitalised for six weeks due to a neck injury. I arranged with friends to bring alcohol to the hospital. As a result I was often under the influence when the minister or doctor visited me. On Sunday, 11 September 1994, I was preparing to attend church as usual as I was also an elder in church at that time. I was sucking the usual peppermints when Ronél told me that the peppermints did not work anymore. You could smell the alcohol through my skin. I was extremely shocked. I phoned my doctor immediately so that he could give me an injection to help with the detoxification. I DECIDED TO STOP DRINKING. Under medical care I detoxified from the toxins in alcohol and since then I have never let alcohol over my lips again. Our daughter Rozél got married in 1998. On 1 October 2003 our first grandchild Simoné was born. A little more than a month later, on 21 November 2003, Rozél was diagnosed with acute leukaemia and 6 months later, on 24 May 2004, she passed away. For parents there cannot be a bigger shock and I was really tempted to start drinking again. Fortunately I could resist the temptation. Our son Hugo got married in 2007 and in 2009 our first grandson was born. Since 1994 the CAD in Worcester has meant a lot to me in terms of assisting me with my recovery. I still attend CAD meetings every Monday night, as well as every camp, conference, outing and other activity that they host. 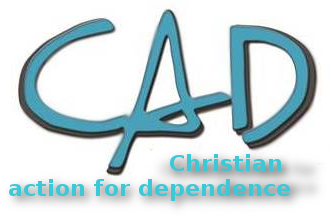 I am proud to declare in public that I am a member of the CAD. In the beginning it was difficult, but because I regularly listened to testimonies of other CAD members in church, I realised that that was what I also wanted to do. The CAD is part of my life and it helps me to reach my goal in life. God leads me to regularly share my testimony in church and also to introduce the CAD to different congregations. Because of my involvement with the CAD I have been the chairman of the CAD branch in Worcester for long periods as well as the chairman of the CAD Regional Committee for the Western and Southern Cape. I have also served as CAD representative on the governing body of Ramot for 10 years. In 2008 I was elected as vice president of the CAD Nationally. I love talking to people about addiction and I believe that it is my calling in life to do so. I do realise that I must always remain humble. You do not always feel good just because you serve on many committees. Some days I feel better and other days I feel worse. It is very important to stay humble and to realise that your salvation is only by grace. It also takes hard work to prevent a relapse. I would like to thank Ronél and Hugo from the bottom of my heart. Your support over the past 17 years has helped me to stay sober. I know that I often caused sadness and hurt you through my behaviour. I sincerely apologise for that. I specifically want to thank Ronél for her continued involvement with the CAD and because she has spent so much of her free time to support me. Thank you two very much!